We shot a video to go along with this recipe as well. You can view it below. For more videos, you can subscribe to my You Tube Channel. 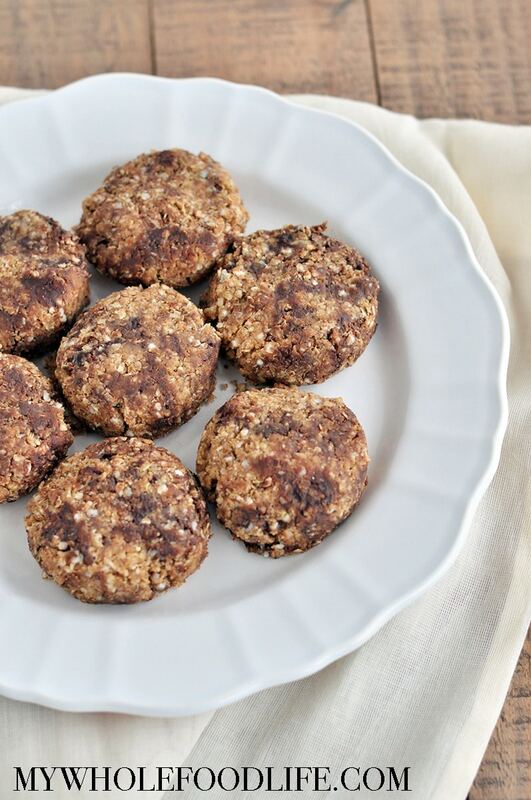 A healthy cookie packed with good fats and protein sure to keep you full for a while. Vegan and gluten free. In a medium sauce pan , on low heat, add the almond butter, maple syrup and coconut oil. Stir well. Then add the shredded coconut and quinoa flakes and mix until combined. Lastly, add the chocolate chips and stir only long enough to mix them in well. Using a cookie scoop , drop cookies onto a lined baking sheet . Use your palm to press each cookie flat. Place in the fridge to firm up. About 10 minutes. These should keep in the fridge for at least 2 weeks. They can also be frozen for up to 6 months. Enjoy! I'm looking forward to trying this recipe! Just wondering how quinoa flakes differ from regular quinoa? Would regular cooked quinoa work as a substitute? Thanks! Not sure if regular quinoa would work. Quinoa flakes look similar to quick oats. In fact, you can use quick oats if you like in this recipe. These look great. I have a sensitivity to even gluten free oats , you think you can substitute quinoa flakes in your other oat cookie recipes?